A new app allows you to back-up all of the content on your Facebook page, including comments and information that's posted on your wall. SocialSafe was launched in the summer and is a piece of software that helps protect the information posted on your Facebook page. This service has now been updated with a Facebook Wall Back-up app - a Ronseal-esque function that allows you to collate all the content on your Facebook wall. This is also complimented with a new Time Capsule feature, which allows you to chart the history of your Facebook pages. Speaking about the the new features, Julian Ranger from SocialSafe explains: "It's important for users to have complete access to their own data whenever they want it. Often people don't think about how long data remains available to them when stored within social media sites such as Facebook. "As we all share more personal details within social media sites, knowing that those key moments in time are captured forever provides an essential safeguard." 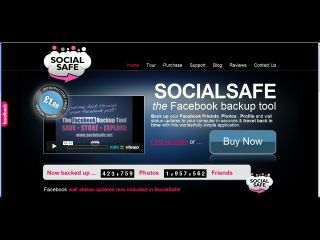 SocialSafe is available now, on both PC and Mac, with all-new Wall Back-up and Time Capsule functionality for the introductory price of £1.99. Got to www.socialsafe.net for more details.